Here's a quick and dirty demo of some of the sounds available on the B11th tuning. Over on Facebook, we were talking about B11th and I wish more players would try it. The dominant chord voicing it offers are just beautiful plus you have 6th chord/min7 intervals on top. It's known for those lush sounding dominant chord voicing but there's much more available in the tuning and IMHO, it's quite unexplored. The first part of the clip is just the open string notes, then an approximation of the tune "Sand"(from memory) and a no-fingerpicks run through of the chord progression of James Taylor's Fire and Rain that appears in my B11th book. A bit sloppy, but I have the flu so don't have the energy for trying to get the best take. The tuning (low to high) B, D#, F#, A, C#, E. For some tunes, I use a C# on the bottom. For the 8-string version, I like a low B.
B11th tuning is one of the most beautiful tunings used in non-pedal steel guitar playing. Its lush, closely-voiced intervals offer a palette of sounds and moods that few other tunings can match. The B11th is essentially a detuned version of the A6th tuning popularized by Leon McAuliffe and other Western Swing players beginning in the 1930s. The top four open strings are identical to the A6th tuning. However, B11th can be difficult to conceptualize because it combines two different tonalities: A major and B dominant - in two different keys: A and B. We have a major 6th in the key of A on top, and in the middle and lower register, beautiful voicings of B dominant 7th, 9th and 11th chords. 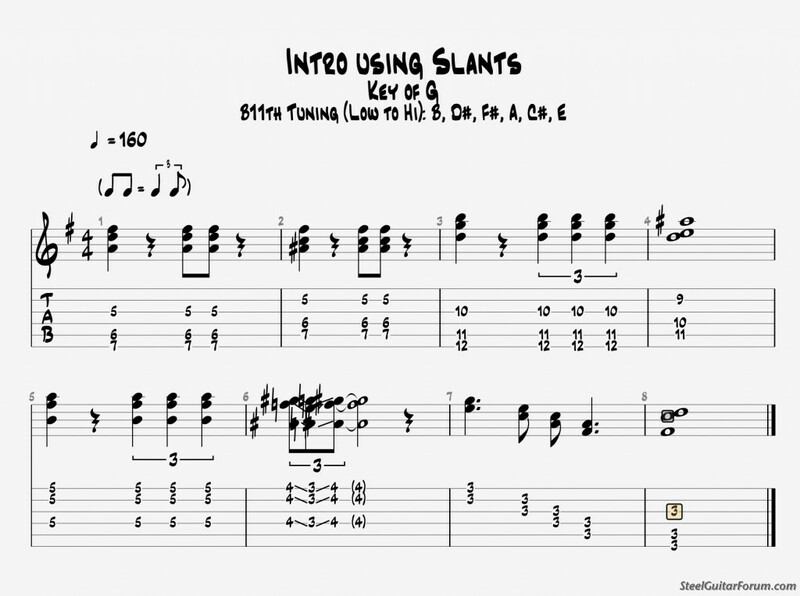 While slant positions are less common in B11th than some other tunings (like C6th), there are still opportunities for slants that are worth exploring. The timbre and tonality of the straight bar dominant chord voicings is the key selling point of the tuning and it excels with songs that feature dominant harmonies. As you’ll see in these arrangements, it’s a much more versatile tuning than many players might think. Melodies on the top strings lay out in a very logical, playable way in B11th, plus the tuning offers inversions all of the commonly used chords without bar slants: Major, Minor, 6th,7th, 9th, Augmented, Diminished, Minor 6th 11th, add9, plus other chord extensions. Nice demo, Andy. You're right about B11 tuning. It will unlock some captivating and elusive sounds that are not available on other tunings. I have Andy's B11 book and there are some great TABS in it, including my favourite tune of all time, Nuages, a haunting mainly chromatic melody by the incredible Django Reinhardt. Andy's take on it in B11 is "off the wall". Doug's Moontide is a great tune and my Steelies club loved my attempt at it at one of our meetings. I play it when I'm playing at home just for myself. Maui Moonlight is another good B11 original tune from Doug. I'm not musically educated enough to identify chords on any instrument, but the chords available in this tuning are indeed dreamy. My ears just love them and when it sounds right it is right! On slants in B11, Alan Akaka's arrangements tend to have plenty! Including the infamous reverse split bar for a passing diminished...think, third fret straight, play strings 1,2,4. Then reverse split bar, 2nd fret 4th string, first fret 1st and 2nd strings. (A nice finish is first fret on 2/4, open on first string) Of course you can do that in A6 too! But overall it does feel like it needs less slanting overall. Yeah, slants are definitely there for the finding in B11th! Sometimes tricky to play in tune without some bar pressure or behind-the-bar pulling but creativity is rewarded. what Anthony Locke is doing in that video is exactly where I'd like to try to go next with my steel. Do you happen to know which variation of the B11 tuning he's using there? it's F# A C# D# F# A C# E (low to high). it's a semitone away from A6 - middle E goes down to D#. here's Anthony discussing his tunings. his middle neck is tuned to the tuning Joaquin Murphey came up with. Thanks for that, Andy--this was the perfect thing for me to see right now. Timing is everything! here's a playlist I made. Wayne Hancock live at Bank Street Cafe in New London, Connecticut. May 17th, 2008. The guy who filmed the night numbered the songs in order! I like any tip that lets you learn two tunings/ necks at once. I need to brush up on my C6 PSG neck and learn B11. Andy's book is great. It's been on my "to do" list for awhile in the practice room. I'll get that out tonight. I just tuned to B11 on a 6-string lap steel and found myself playing almost as if it's a 7-string A6 tuning, low-to-high: A C# E, found two below, then up to F# A C# E. Now I want to dive into some of those lush chords, thinking in B instead of A.
I hope it's OK to add a plug for Andy's books. The B11 book is related here, but they're all great. I sat down and played "Sand" last night from the B11 book. It sounds great and isn't too tough. B11 is a great tuning! Thank you, Andy! thanks for another great link. I need to get out and hear Tony play live. I hope he's still in Austin.